Two Minute Dog Advice columnist Wendy Nan Rees shares a budget-friendly homemade holiday dog gift idea that's easy to make and fun to give. When it comes to the holidays, I have to honestly say, sometimes I can get a bit stressed out. I have so many family members to get gifts for, not to mention my closest friends who I want to get gifts for, that my poor budget just cannot take this kind of hit. So I have come up with my own way of dealing with this. I make gifts, which I have found my friends and family love even more than anything I could buy, which makes me feel wonderful and my budget feel even better. Often when I get invited to a holiday dinner (for example Thanksgiving Dinner this year is at my sister's home and she doesn't need me to bring any food) I do not want to come empty handed so I am making my Holiday Dog Gift Bag. I will fill it with a few fun treats and a toy for Gomez, the family dog, so he can have something to do while we are all eating and he will not feel left out. While this is an easy bag to sew, if you do not sew then you can use fabric glue to complete the project. If you use fabric glue then make sure to wash the fabric after you make the gift bag, just to be sure everything held together well before you do your decoration. This way if you have to do a few touch-ups, it will be easy. Please note: You can use many different types of fabric (I've used denim, flannel, canvas and cotton and love to use pre-quilted fabrics (blue, yellow, olive). The size of bag you want to make will depend on how many yards of fabric you purchase. For this bag you will need two yards of fabric which will leave you with plenty of left over just in case you make a mistake. You can be creative and make a jar, oval or even a square shape when cutting your two pieces of fabric. Cut two 10-1/2 x 8-inch rectangles and one 6-1/2 inch-diameter circle from each fat quarter. Join the short ends of one pair of matching rectangles, stopping each seam one inch from the same (top) edge, to make a tube. Sew a matching circle to the tube's bottom edge to make a bag. Join the short ends of the two remaining rectangles, leaving a three-inch opening in one seam. Sew the matching circle to the tube to make the lining. Insert the bag into the lining with right sides together. Sew around the upper edges with a 1/4-inch seam allowance, then turn right side out through the opening in the lining. Sew 3/4 inch and 1-3/4 inches from the edge to make a casing. Starting from opposite sides, thread two 1-yard pieces of 3/16-inch-diameter cotton cording through the casing; knot the ends of each cord and pull to gather the fabric. After washing the gift bag, it is time to decorate it. If you use a patterned fabric you may not need any decorations. You can use fabric paints to add a nice touch like the dog's name or you can add a few fun decals. Glue or stitch wide ribbon in a coordinating color to the top edge of the added fabric. To fill the bag use some homemade biscottis, a simple ball or you can make a homemade toy. Anything you put in it makes a fun gift. 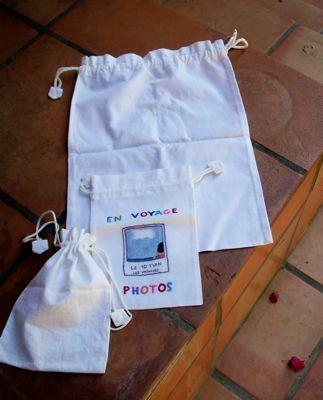 The bag is really the gift and when your friends travel with their dog it will come in handy. Have fun and add your own personal style.